Mali on a map takes the shape of butterfly wings. Both wings encapsulate sub-Saharan ethnic groups boasting rich cultural heritage and the wealth of familial love and respect within communities. The larger wing is partly occupied by various factions of radical Islamists who’ve managed to carry out attacks throughout the country, including Bamako. It was a coup d’etat that led the United States government to shut down the Peace Corps program in 2012. 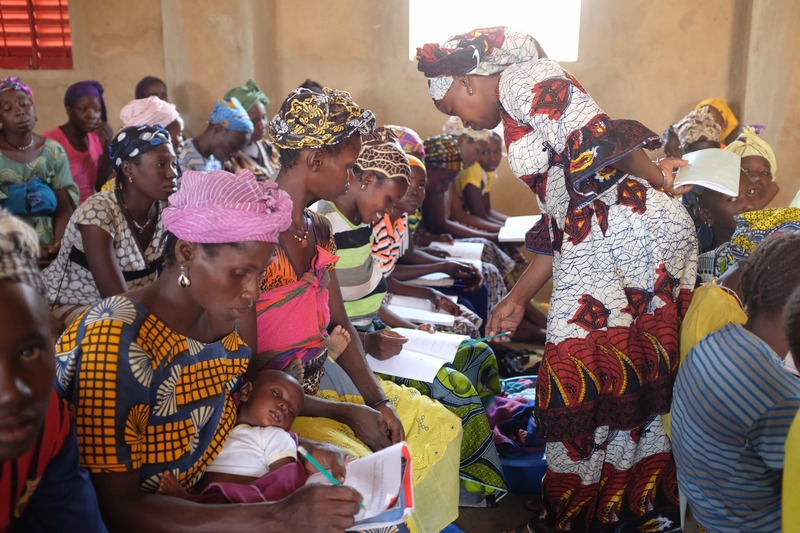 Despite this debilitating development, as Associate Director of African Sky, Colleen has managed to implement successful, sustainable programs in Zeala, the original community she lived in roughly 50 miles north of Bamako. African Sky also supports adult literacy programs in Dissan and Markala that focus on reading, writing, and basic math. Zeala is a Bambara community with few elders and a burgeoning population. Mud brick walls form a maze around mud brick houses. There’s a large mosque, a small church and a dusty soccer field. After months of women gathering to find shade during hot season so they could learn simple arithmetic and writing, male community members built a literacy center for women with Colleen’s leadership, along with African Sky Founder and Executive Director Scott Lacy, years after her time in Peace Corps. “There was a need for space,” Colleen explained. “It’s dusty and hot. The wind blew down the chalkboard and broke it in half.” With the support of African Sky, the men living in the community used compressed stabilized earth blocks to build a center for the women to hold classes. In Zeala, there were only three women who could read and write at the time. These women were taxed with other nongovernmental organizations needing to utilize them consistently to relay information. One of these women, Elizabeth Traore, first began working with Colleen as the secretary and leader in the women’s Shea cooperative in Zeala. African Sky supported Bambara literacy training for Elizabeth, which gave her a deeper understanding of teaching. Elizabeth now leads the women in the literacy class. In a country where literacy rates are low, this is a monumental development. During the Ebola crisis in various countries throughout West Africa, African Sky integrated Ebola education into literacy group curricula in three rural villages, including Zeala. African Sky’s efforts were noted at the Clinton Global Initiative University meeting in 2015. When Colleen asks the women of Zeala why they study, they say “to come out of the darkness.” Colleen hopes the women eventually demand more rights and opportunities for leadership in the community. Visit our Instagram page to see more of Colleen Naughton’s photos.